Don't you think that as chief minister of both the Muslims and Hindus of Gujarat, you must first bridge the distance between the two communities? I had gone to Vankaner after the riots. The Muslim society had organised a function to felicitate me. 15,000 Muslims were there. Congress MLA Kadir Pirzada was chairing the meeting. Look at the level of hatred! He was sacked from the party for attending my function. Can any society function in this manner? Sensible people ask why can't politics wait in Gujarat so that the pain can first be cured? We too are saying so. Don't hurt us any more and let the people decide. Let this chapter end. Let the curtain go down. The Congress doesn't want it. They know they have lost Gujarat but they want advantage outside Gujarat. A conspiracy is on to defame Gujarat internationally. Ehsan Jafri's daughter was alive and doing well in US, at that time here it was said she was raped. If such lies are used to defame Gujarat then it is my duty to fight back for Gujarat. If you want to assess rehabilitation work, do it properly. After 1970 more then 440 riots have taken place. These are the first riots where an all party committee has been formed under the governor's chairmanship. This is the first time a rehabilitation project has been made. In the past not even a paisa was spent on victims. Even today we are witnessing processions taken out by victims of the Bhopal gas tragedy. Even after 15 years, the problems of Kashmiri Pandits in J&K are unattended. And all of you want a magic wand in Gujarat. Whatever I do, whatever decision I take is weighed with reference to Godhra. Even if I transfer a government employee it is seen in connection with the riots. When someone visits Gujarat it is the riots they talk about. Even after four months if you can�t stop politicising the events, we can�t help. It badly affects the development of Gujarat. Even if investors are considering us, they will be confused. I could have continued in power. Look, people who criticise me have one viewpoint. I have another. But who should decide the case ultimately? The people. So I opted for a poll. I am not in a hurry. Let the people select their leader in their own time. Let us decide this once and for all. After the election a new thought process will start. Shriman Lyngdoh claims in his report that this government has lost the confidence of the people. What is the best way out? Let people decide who has the confidence of the people. He should displace me through an election. Why is he not giving us an early election? In democracy why is he allowing a person like me to continue in office? He should show me the door if he believes in what he writes. Your critics allege you want an election for a very simple reason -- to encash the provoked feelings of the Hindus. So you believe now� that Hindus were provoked after Godhra. On the other hand you allege that all these riots are the government�s handiwork. When it comes to the election issue you accept that Hindus are provoked and in routine course you blame the government for the riots. You should decide before you judge us. Is the BJP not playing the Hindu card? I need not waste my energy to explain this. I just have to spread out the facts. Let me tell you this country is not going to get divided on the Hindutva issue. In Gujarat I am not talking of Hindutva. I am talking of swabhiman [self pride]. In the election I�ll talk about the pride of Gujaratis. I will be talking of that Gujarat which many centuries ago accepted Parsis. I want to drive my people towards that glorious identity of Gujarat. Those people are perverted who are not looking beyond Godhra. These mentally retarded people are the problem of India. A few of your supporters think you are a potential candidate for the country�s top post. I never imagined that one day I would become chief minister. I am not the right man for this. I am a person who belongs to the organisation and the cadre. I am a person who would like to work behind the scenes. What is your analysis of the fight between the Congress and BJP? Look, Gujarat has a distinct mood. The Congress doesn�t suit the mood of Gujarat. It�s a case of mismatch. The Congress is doing various caste experiments. KHAM [Kshatriyas, Harijans, Adivasis and Muslims] was one of them which could not survive for long. The Congress doesn�t understand the minds of Gujaratis. The Gujarat Congress is going the way it has been in Uttar Pradesh. Gujarat does not have a third force, otherwise the Congress would go to the 4th or 5th place. The same Gujaratis fought a battle against Chimanbhai Patel [former Gujarat chief minister]. It was not a communal divide. Gujaratis have habit of speaking against injustice. I have understood the qualities of Gujaratis and that�s the focus of my proposed Gaurav Yatra. 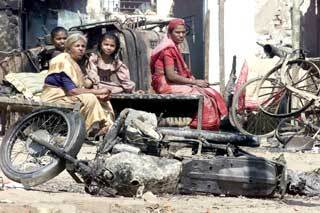 Your Gaurav Yatra skirts the main issue� why did Gujaratis indulge in such horrible violence? I am taught that what happened in 1947 and the painful events of that time should not be remembered again and again. The Mumbai blasts should be not reminded of again where so many innocents died. Secularists taught this to us. Now when Gujarat has happened they don�t want to lessen our pain. Let the secularists decide whether we should go back to revive our memory of 1947. Shall we keep talking about the people killed in the Mumbai bomb blasts? Shall we keep talking about the innocents killed in J&K? I believe that in the life of any person or in society, weak moments do occur. But to achieve the best, you have to think of the best. One of the best moments for Gujarat was when Parsis came to the state. In these times I would re-establish Gujarati�s pride, which is at stake.